Greetings to our company supporters! -Full balance due with registration submission. -No table top display over 3 feet, no floor displays over 6 feet, and no displays wider than the table. If you have pledged to sponsor at the Gold Level ($5000) and above, please inform Finance Chair Chinomnso Maduka at finance@nsbedc.org so we can process your free table. Please direct all other questions to Jade Nobles at pd@nsbedc.org. Greetings NSBE DC Members and Supporters! 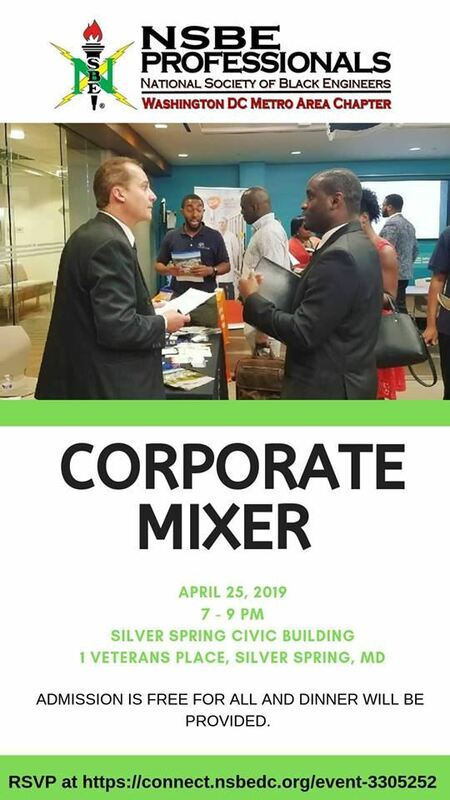 You're invited to attend our 2019 Corporate Mixer and Professional Career Fair! Come network with top recruiters in the STEM industries, learn information about hot job openings and even interview on-site with preferred employers! This event is geared toward experienced professionals and graduating seniors. And even if you are not looking right now, this event will give you access to network with recruiters because you never know when that opportunity will pop up for you in the future! We will be announcing new companies as we get closer to the event, so stay tuned our email digest (you can join HERE) and social media accounts! Heavy hors d'eourves and beverages (including beer and wine) will be served by Corey's Kitchen, a black-owned caterer in the area. Please direct all questions to Jade Nobles at pd@nsbedc.org. Parking is available around the building. You can find suggested garages HERE. The nearest Metro station is Silver Spring on the Red Line, a 12-minute walk from the Building. May General Body Meeting: NSBE DC Elections! NSBE DC Elections will take place on Monday, May 6, 2019. Come out to hear the candidates running for the NSBE DC Executive Officer positions (and if time permitting, the NSBE DC Appointed positions) for the 2019-2020 term! Let your voice and vote be heard! To learn about the NSBE DC Election process and the latest nominee platforms, go to https://connect.nsbedc.org/2019-NSBE-DC-Candidates-Handbook. To vote, you must be a paid NSBE DC chapter member. To join or renew your dues, please go to connect.nsbedc.org/join. The NSBE DC Elections is free for everyone to attend! Dinner will be provided. Please direct questions and concerns to the NSBE DC Parliamentarian at parliamentarian@nsbedc.org. Please direct NSBE DC membership questions to the NSBE DC Membership Chair at membership@nsbedc.org. Monday, May 21, 2018 May General Body Meeting: NSBE DC Elections! Wednesday, December 13, 2017 NSBE DC Hip Hop Hooray Holiday! Monday, November 06, 2017 November General Body Meeting: 2 Hype For 2018! Monday, May 01, 2017 May General Body Meeting (GBM): NSBE DC Elections! 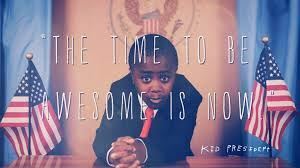 Monday, April 03, 2017 April General Body Meeting - Nominations! Monday, May 02, 2016 May General Body Meeting (GBM): NSBE DC Elections! Monday, April 04, 2016 April General Body Meeting - Nominations! Monday, December 07, 2015 December Professional Development Meeting: "Black is the New Green"
Saturday, August 22, 2015 NSBE DC Cookout: Welcome Back Luau!